Yesterday, we launched The People’s Bot, offering scholarships, media fellowships, and an auction for people to attend and report on events where they are not physically present, including CHI 2014 and a 13 year retrospective on wearable computing and Google Glass. 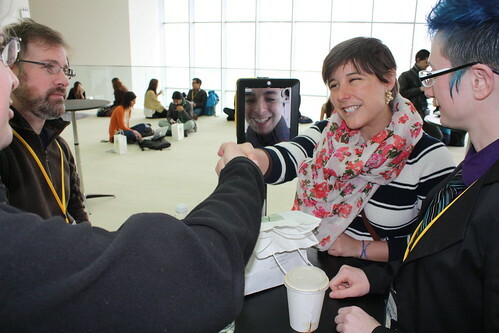 Together with Nathan Matias, we’re imagining uses of robotic telepresence for the public good. Last month, Edward Snowden was in Vancouver to attend the annual TED Conference. Sort of. Since his historical leak of NSA surveillance documents last year, Snowden has been living in exile abroad in order to avoid prosecution from the U.S. government. 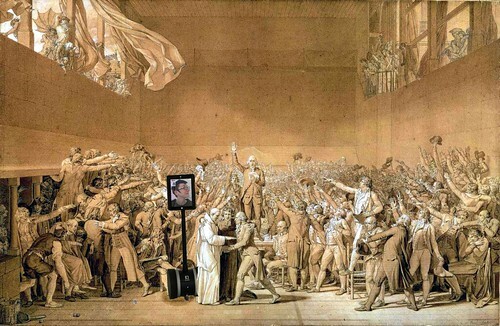 Yet, in spite of severe restrictions on his mobility across borders, he was able to attend the high-profile TED event from an undisclosed location in Russia via robot, which enabled him to move around stage as he presented his views on privacy and surveillance to a captivated audience thousands of miles away. 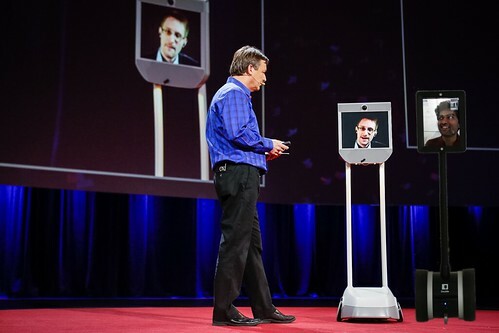 Snowden’s appearance shows the power of robotic telepresence to extend opportunities to people who otherwise would not have access to high-profile events like TED. On the other hand, the Snowden bot could simply demonstrate the role of cutting edge technologies to extend the reach of only the most well-known, wealthy and elite members of society. While there exist a few heartwarming stories of housebound children who use bots in order to to remotely attend school with their friends, telepresent robots are often pitched as a technology to extend the influence of those who already have money and power. As these bots become cheap and reliable enough to become consumer products, we need to develop practices and expectations to use them to broaden access and inclusion for less privileged groups. After Snowden’s appearance at TED, my colleague Nathan Matias and I began to ask ourselves how we might promote a more thoughtful conversation about future opportunities to use robotic telepresence for values of inclusion and public good. We created The People’s Bot, to experiment with robotic telepresence for the public good — broadening access, supporting public interest reporting, and funding access initiatives. The People’s Bot is related to Sam Gregory’s idea of “co-presence for good” in human rights and disaster response. Responders and activists are using video conferences to bring together diverse teams across barriers of geography, exclusion and timezones. New technologies like the Media Lab’s unhangouts are expanding the tools we have for fast cooperation across distance. Our work is also related to work by the Institute for Applied Autonomy, who created the idea of “contestational robots” that are used to introduce speech into areas where speech has been restricted. This month, we are working our friends from the iHub, a tech innovation hub based in Nairobi, to pilot the People’s Bot during the Spring Member’s Meeting here at the Media Lab. This is an exciting time when researchers from across the Lab share the latest developments in their research with the Member community. We’ll be using the People’s Bot to create access for our colleagues who would otherwise be unable to attend from halfway across the world. Auctions: For anyone else interested in bidding for thirty minutes of telepresent roaming time, during which they are free to explore the Wearable Computing Exhibit at CHI. We will donate the proceeds from Ebay to the CHI student travel fund. Bid for Bot Time Here! These will be an exciting and jam packed next few weeks, in which we hope to learn a lot from our experiences with The People’s Bot. Stay tuned for future developments!